The Perseids are here. Have a seat. Put it on your calendar: 1 a.m., Thursday morning (i.e., tomorrow night). The Perseids — the year’s best meteor shower — are coming to a high, poorly lit place near you. Hundreds of flashes of space debris will color the night sky. Best part: they correspond with a new moon, meaning they’ll be brighter than ever (-y year since 2007, the last time that happened). Don’t even think about heading up to your building’s roof, unless you live on a garlic farm on a hill in Gilroy. S.F. is too brightly lit — not to mention too prone to cloud cover — to be considered a good choice. First, leave our (overcast) city by the bay. Then make for high ground. Coyote Lake at Harvey Bear County Park normally closes at sunset — but this high, dark spot will be open for a viewing party from 1 to 4 a.m. 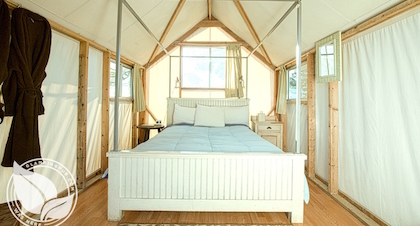 If you’re looking for something less social (and have the option of rolling into work a little late on Thursday morning), consider an overnight glamp. Check into this spot in Pescadero and you can watch the Perseids from a hot tub. A one-bedroom suite at the Calistoga Ranch comes with its own private outdoor living area, complete with fireplace. They can also supply the Champagne, or something a little more local.